Saints and angels are quite popular these days. Perhaps your colonia (neighborhood) in San Miguel de Allende is named after one: Guadalupe; Santa Julia; San Juan de Di-s; San Rafael; San Antonio, etc. 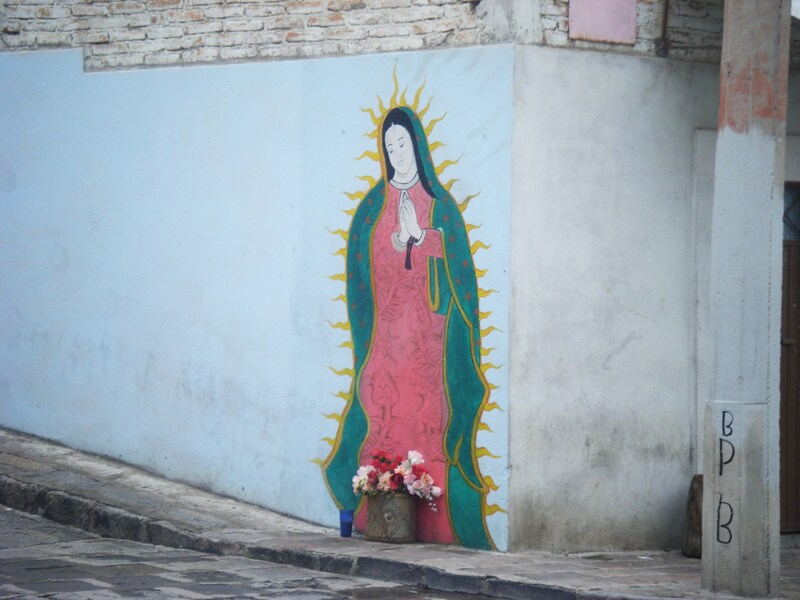 In Mexico, they are more than just key chains, good luck charms, or statues in the church. They are a key component of the Mexican Catholic faith, worthy of worship and regular offerings and petitions. In addition to their adoración via offerings in the iglesia and at home, one may also worship, express gratitude, or make a request by completing a peregrinación (pilgrimage). This consists of walking miles, often for days or weeks in a group from your home town to another church or pueblo where you will visit, deliver, or pick up a relic of the saint or angel and leave it in another town’s church. One may also create a home altar for his or her saint or angel. 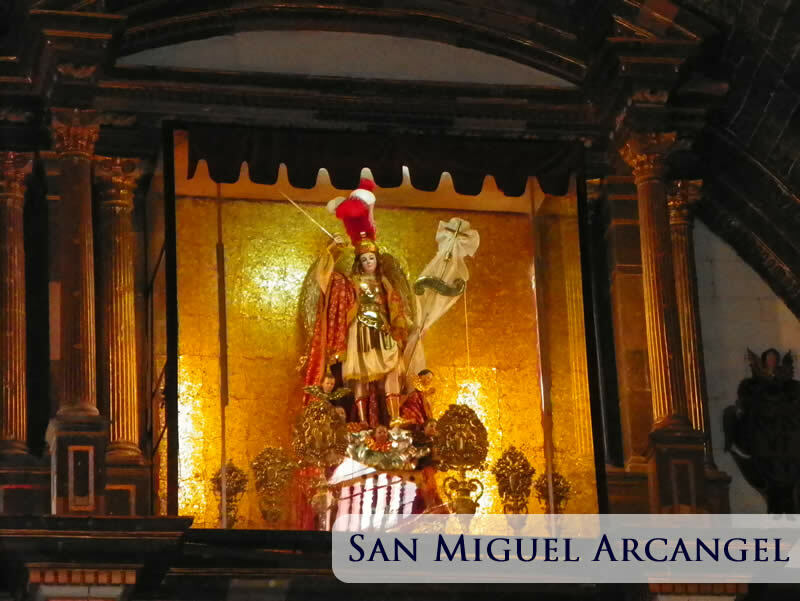 San Miguel Arcangel is the Patrono de San Miguel de Allende and is a protector who carries a sword. He helps you when you need protection (physical, emotional, or from witchcraft). 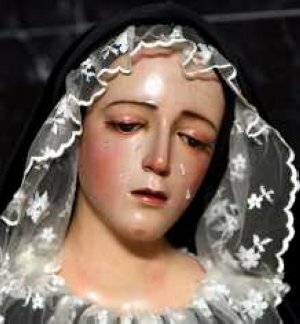 La Virgen de los Dolores understands the pain of losing a child. Of watching one’s own child suffer and die. San Francisco is the saint of animals and had stigmata. San Benito y San Rafael protect against witchcraft, spells, and evil against you or your household. The ruda plant (rue) is also known to be helpful to keep at the entrance of your home and/or business as it absorbs bad energy and negative spiritual influences, as well as coconuts strategically placed throughout the home. *Ok. I took my own liberties with my translation for the sake of rhyming. The Spanish version just says that no one will upright him. Pobrecito de todos modos. 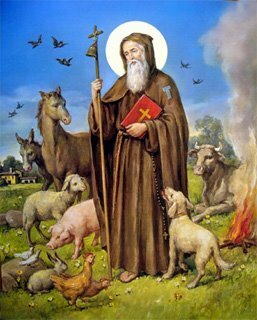 San Antonio Abad is the saint of animals. 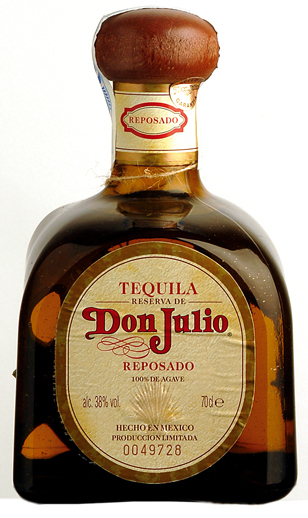 When your cow or prize-fighting gallo becomes ill, this is your go-to guy. Here in San Miguel, he is the sponsor of the Blessing of the Animals day and Blessing of the horses, too. San Judas Tadeo, saint of impossible situations, helps you get a job and maintain your finances. He carries a coin. You say the prayer of San Judas and light a green candle for him until you find and retain gainful employment. 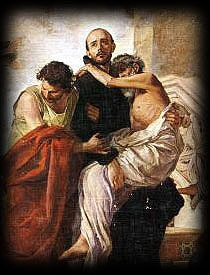 San Juan de Di-s helps the sick, mentally ill, addicts, and downtrodden. 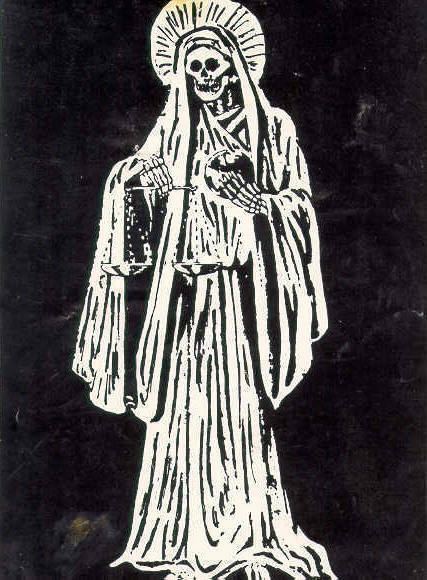 La Santa Muerte is a Mexican’s “best friend, his daily companion” according to revolutionary Mexican artist, David Alfaro Siqueiros. This idea is also well expresed in the book and movie, Macario, by Mexi-German, Bruno Traven. While death is regularly mocked in Mexico, it is also highly revered. 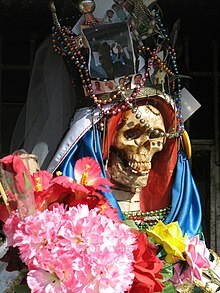 With roots in Aztec faith, Mictlantecuhtli, the Aztec god of death, now is combined with Mexican Catholic Santeria.The skeleton wearing a cape representing holy death is the saint and protector of criminals, gang members, those who do evil, and narco-traficantes (drug-traffickers). “Cleanliness is next to Godliness” had to have been originally quoted by a Mexican. Mexicans value cleanliness so much that it is the first thing one does after arising and the last thing one does before bed. During the course of the day, one needs helpers if things are to be kept adequately clean. First things first: the sidewalk in front of your house. You don’t want your neighbors seeing a surplus of fallen leaves just outside your gate or dog urine or an empty Coke bottle. This is what “not taking care of your house and family” looks like. As for before bed, well, there are dishes and teeth to be washed, faces to be scrubbed, and showers to be had by all. One person alone could never take on all the dirst that comes your way during the day. This is why my maid has a maid. And her maid has a maid. And I’m nearly certain that if I were to investigate, I would discover that my maid’s maid has a maid. Maid service in Mexico is like having a garrafón or basic cable. It is not optional. 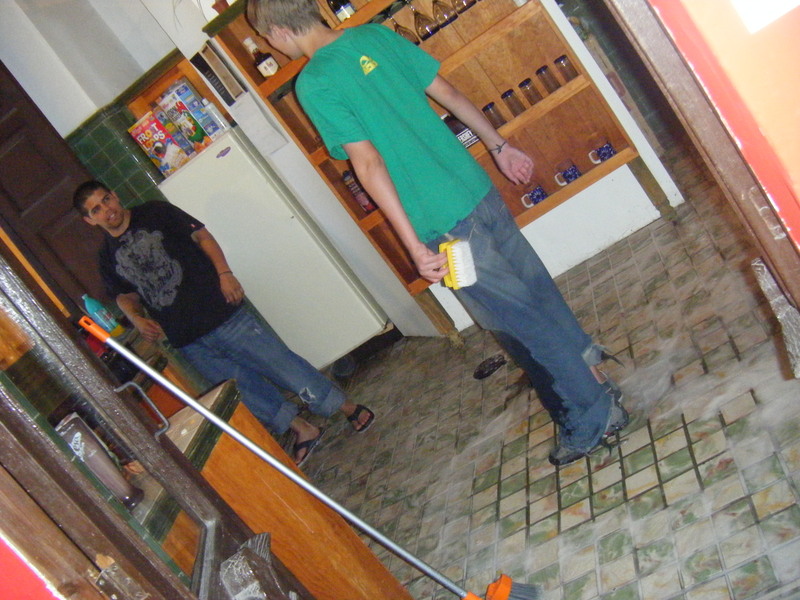 A male Mexican friend of mine was watching my then 15 year old sweep and mop the tile floor of my bookstore one day. I felt proud and content, like Mother of the Year. Unfortunately my friend interrupted my self-satisfaction with, “Why don’t you teach your hijo to clean?” What?!? Was my son not there, sleeves rolled up, pushing a wet soapy mop around like nobody’s business? “He is cleaning,” I replied. “I mean real cleaning,” retorted the Mexican. I gave the Mexican permission to “teach” my son “real cleaning” and I stood back to take notes. A hand-held scrub brush was produced, as well as a bucket of fuming bleach water mixed with purple Fabuloso. I pulled out the camera as the two young men rolled up their jeans, hit their knees, and began to sweat profusely while manually removing any trace of dirt from the last 500 years from my antique floor. 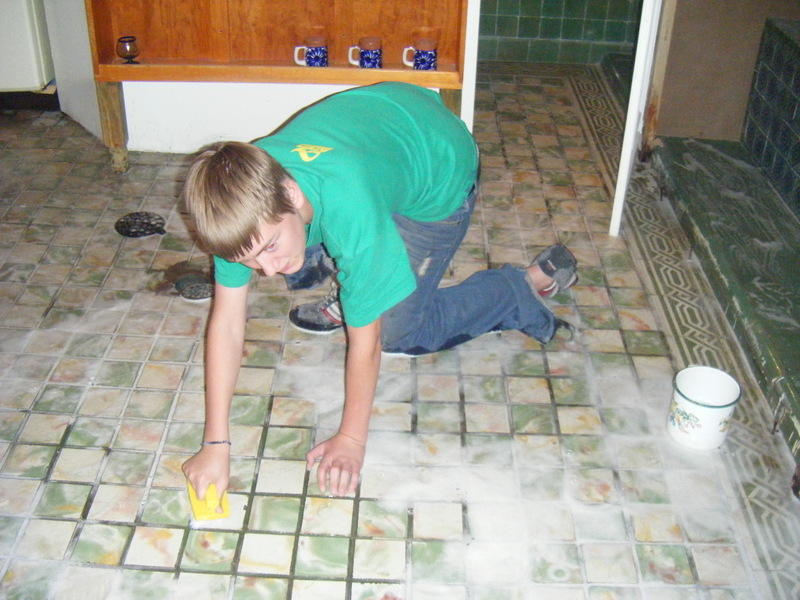 A Mexican taught me to clean a floor. I never felt so dirty as when I started dating Mexican men. The same scrubbing that applies to a Mexican floor is generally applied to the entire body, including eyelids, scalp, behind the ears, between the toes, etc. (I prefer to wash the hair once every other day to avoid dry-out.) My sidewalk woud shame even the dirtiest street person. I use only a standard mop from the tiendita when doing my twice a week rounds. 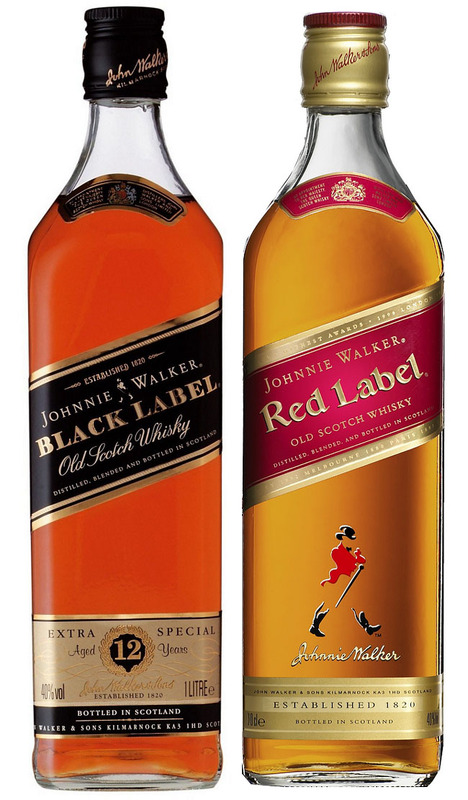 My maid is called in for emergencies only, and that only being once a month on avergae. I do not wash my clothes by hand with the outside patio clothes-sink. (That is already occupied by Christmas items waiting around for next December.) It is a rare occasion that I stick my hand in the toilet, the obvious best way to get it clean, according to Mexican ways. I leave the cozy seat on my toilet, to avoid unintentional drownings. (Many-most Mexicans remove this seat with tools upon purchase so as not to pose any interference with typical hand-in-the-bowl daily cleaning. Have you ever gone to a department store in Mexico wanting to purchase a new brasierre only to learn that trying on any kind of under garment is strictly forbidden in most states in the republic? Have you looked for tampons in a local pharmacy (outside of foreigner-laden San Miguel de Allende or la playa)? They are rarely to be found. Want to buy a transparent shower curtain? Think again, pervert! These kinds of behaviors and dry goods simply do not jive well with virginity. How Can I Know La Virgen? Who is the first person one should approach with a problem, worry, or confession? La Virgencita, that’s who! Light her a candle and take off a load! She can be trusted with everything from small decisions to heavy burdens. Most altares for La Virgen de Guadalupe are placed prominently in one’s entryway or in the sala for easy access. No one knows tristeza and angustia like the Mother of G-d, who bore the Jewish Messiah as a confused 15 year old virgin, only to watch her promised child die in his early 30s a shameful and agonizing death. La Virgencita does not judge or shame, she is all-accepting and all-forgiving. Not only is La Virgen the Mother of the new, Mestizo Mexico, but she existed long before as the central Goddess in Aztec society as Tonantzin(Toe-nant-SEEN, or Our Revered Mother/Mother Earth). Lupita, our Lady of Guadalupe, first appeared on December 9, 1531 (not December 12, as she is presently celebrated), the first day of the Goddess Tonantzin’s holy festival. 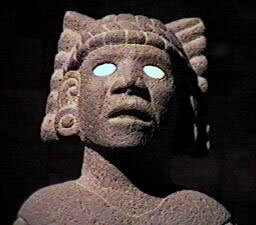 Not only did Lupita speak with Juan Diego on the first day of Tonantzin’s celebration, but she also happend to make her appearance RIGHT ON Tonantzin’s worship shrine at the Cerro de Tepeyac (hill of Tepeyac) in the Aztec center of action, presently Mexico City (El DF: El Distrito Federal)! Coincidencia? I think not. Whatever her true identity, she remains the central figure of Love and adoration by indigenous Mexicans, Mestizos, and Mexican-born Spaniards alike. She united the indigenous of Mexico with the Europeans, the conquistados or chingados with the conquistadores or los que chingan. She was and remains the Great Mediator of Mexico.